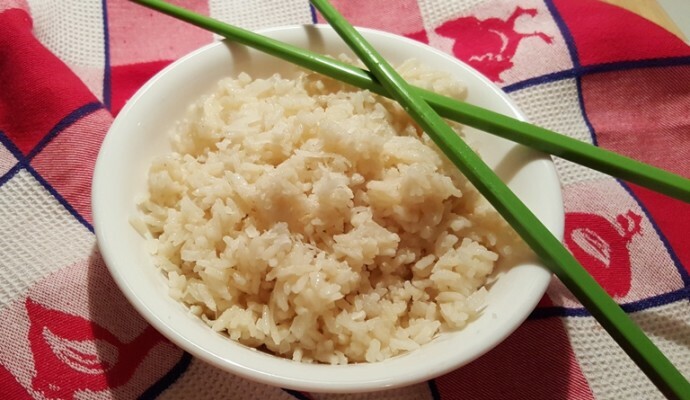 Pressure Cooker Thai Triple Coconut Rice, is fragrant, rich and moderately sweet and creamy. 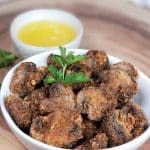 This recipe is similar to Natalie Thai. There is a restaurant in Los Angeles called, Natalee Thai that made the Best Coconut Rice. Back in the late 80’s, the girls from the office and I used to order in Thai food from Natalee all the time. I fell in love with their coconut rice. Oh, and their Pad See Ew (that’s how they spell it), is the bomb! 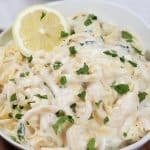 The restaurant also had a location near my house, which was awesome, but since I no longer live near their Venice location, I had to learn to make this myself and make it faster in the Pressure Cooker. If you can’t get your hands on Coconut Sugar, try Demerara Sugar or raw sugar. If you can’t get any of those, white sugar is fine. I just prefer using Coconut Sugar or Demerara Sugar for this rice. 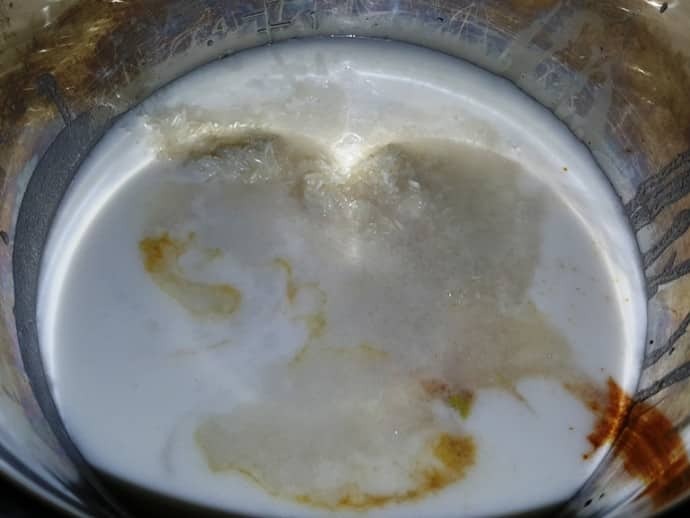 My favorite Coconut Milk is Chaokoh Coconut Milk. Please note: I am using a regular Dry Measuring Cup to measure the rice in this recipe. I am not using the plastic “rice” cup, which is usually comes with most Pressure Cookers. Rinse the rice really well, until the water runs clean. 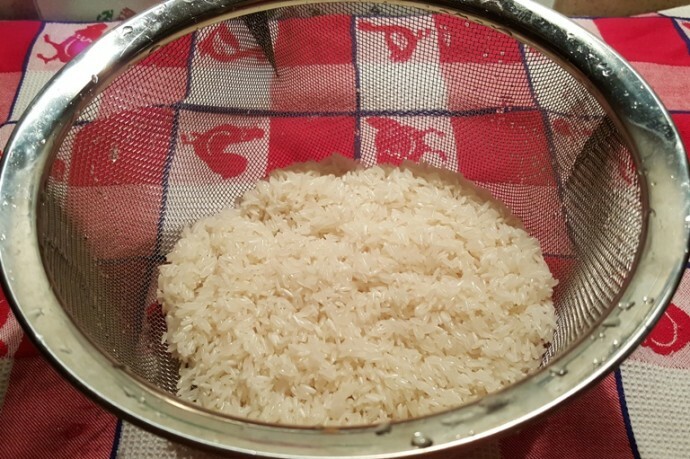 If you don’t have a rice washing bowl, use a strainer to wash the rice, but be careful washing rice in metal, as the rice can break. 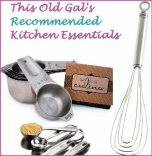 I have a silicone strainer that I usually use, but I do like kitchen gadgets that do double duty. 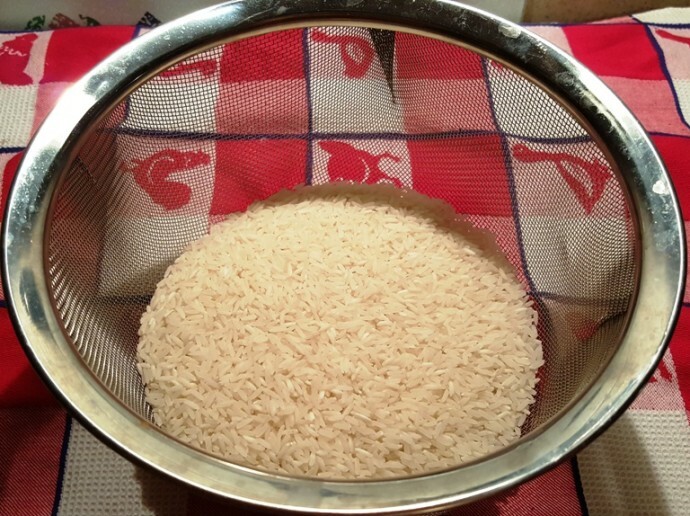 Once the rice is all rinsed, dump the rice into your Pressure Cooker. Dump in the Coconut Milk, Water, Coconut Sugar, Salt and a tiny drop of Vanilla Bean Paste or Vanilla Extract, if you like. If you want even a creamier and stronger coconut taste, try adding in a Tablespoon of Kara Coconut Cream. I like this brand because it is not as sweet at the canned brands of coconut cream. Only a small amount adds a big pop of coconut flavor. Rinse rice well and then add to the Pressure Cooker cooking pot. Add the coconut milk, water, sugar, salt and the tiniest splash of vanilla, if using. When Beep sounds, allow an 10 minute Natural Pressure Release. 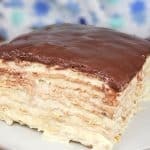 Fluff with fork and top with Coconut Flakes, if desired. 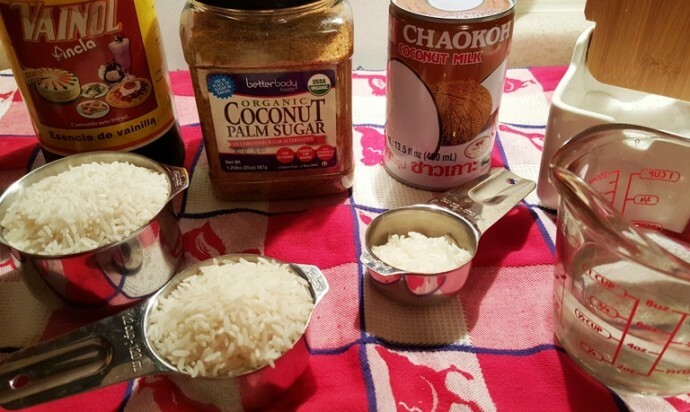 PIN this Pressure Cooker Thai Triple Coconut Rice! Is this like “sticky rice” the thai dessert, usually served with mango? 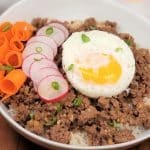 How do I adjust the recipe to use Thai Jasmine Brown Rice? Brown rice takes much longer to cook than white rice. I would suggest first cooking the brown rice with the liquid for 10 minutes and then adding in the chicken and follow the rest of the directions. Thank you so much for visiting my site. So I shouldn’t use the “rice” setting? Just high pressure manual for 3 minutes? Curious to know if your Coconut milk is full fat or “lite”. This recipe looks delicious! I used full fat coconut milk, but light would work too. Is this a dessert? It sounds heavenly. Looks like a delicious dish. If I double the recipe, does the cooking time double as well? 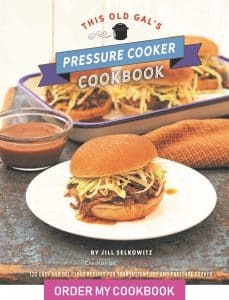 I have just started using a pressure cooker and I’m so looking forward to using your recipes. 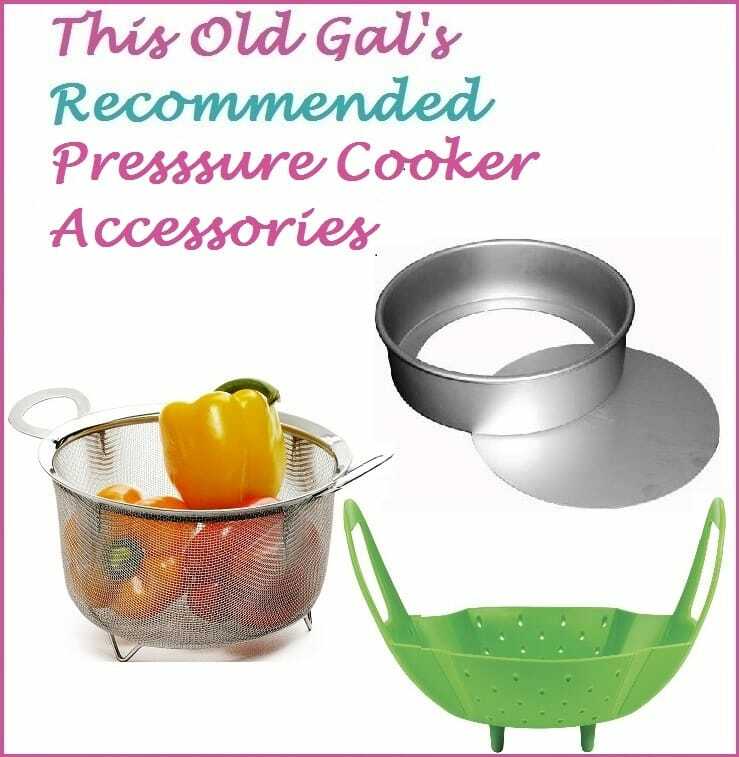 I have never felt comfortable in the kitchen but trying the P. Cooker is something I hope to use a lot. Thank You for sharing all these !! Tried this Jasmine rice recipe in my NEW Instant Pot today. Forgot to add the sugar. First try turned out in perfection! Only problem, I felt like eatting the whole pot by myself. I divided it into 1/2 cup servings and froze it for my later consumpton ! Thanks for such a fun,no hassle, recipe. Only problem, I felt like eating the whole pot by myself. Can you give directions for using soaked rice? I’m trying to reduce phytic acid in my diet. 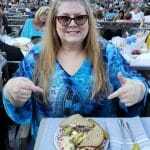 What dish is in your cover picture? 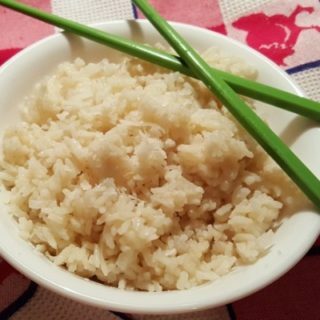 Have you ever used sticky/glutinous rice with this recipe? I was wondering what the liquid-to-rice ratio would be.